In-cosmetics Global lunveiled the winners of its Innovation Zone Best Ingredient Awards 2018 – a celebration of the most cutting-edge personal care ingredients that have been launched in the past six months. Ingredients businesses large and small battled it out for Gold, Silver and Bronze places across five categories – Best Active Ingredient, Best Functional Ingredient, Green Ingredient, Make Up Bar Award and the Sensory Award. 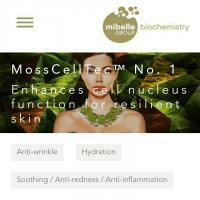 One of our suppliers Mibelle Group Biochemistry managed to win a Gold place for its MossCellTec No. 1 in Best Active Ingredient categories. What a great achievement that we can share to you.